THE UNEMPLOYED EATER: The Best Black & White in LA is in... Tarzana? The Best Black & White in LA is in... Tarzana? Saying the Black & White cookie is often overlooked in the cookie pantheon discussion is an understatement. Actually, it's probably a beneathstatement if such a thing existed. 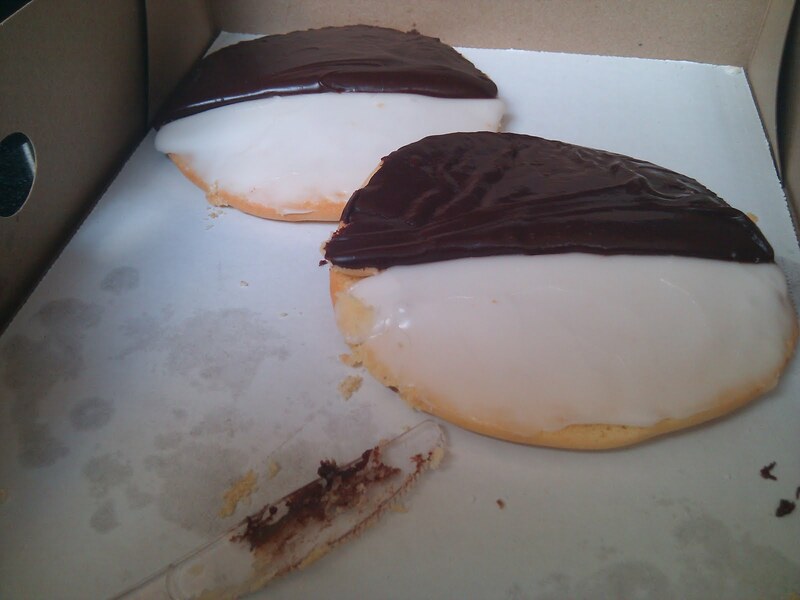 Some people even stupidly call the B&W a Half Moon Cookie. Others don't even know what it is! For those idiots: it's the best cookie on the face of the Earth. And the best Black & White in LA can be found in Tarzana. Yes, mam, Tarzana. The finest combination of yellow cake-like cookie and chocolate and "vanilla" frosting comes fresh from the oven of Bea's Bakery in Tarzana. Bea's oozes with charm, which we all know makes it somewhat of an anomaly for the LA metropolitan area. Bea's is the sort of place with a website that looks in all respects as if it were designed by your 11-year old cousin... in 1998. You know the type: vertigo inducing icons and tons of links which nicely bring you to a page that reads "The site is currently under construction." Note: the site has been under construction for at least four years. But, that's okay. The Black & Whites at Bea's are so good I'm okay if the website remains under construction for eternity. As long as they don't stop pumping out their extremely moist B&Ws... What separates the Bea's B&W from other local competitors is visible in every facet of the cookie. The spongy (but certainly not sponge) cake is better. The white frosting is better. The chocolate frosting is better. Each one of their cookies seems to have been cared for like an orphan puppy. And while LA is home to many fine desserties (read the countless cupcake posts I've written), when it comes to Black & Whites it sometimes appears as if the bakeries just didn't care when they baked them. For example, Santa Monica's 17th Street Cafe, home to the beloved croissant French toast, doesn't even have the colors right! It's not called a Brown and White. The cake is not supposed to be hard like an oatmeal cookie. And the frosting is supposed to be almost gummy in texture. Other well known local spots like Canter's (although I continue to support Zack's dream) and Factor's also deliver a subpar B&W. Its in my blood to adore the Black & White, but I would say I really fell in love with the dessert in the summer of '01 in New York. I was introduced to Nussbaum & Wu, a Columbia/Barnard neighborhood bagel bakery with the best B&W's in the whole wide world. The only Black & White on this coast that compares is Bea's. 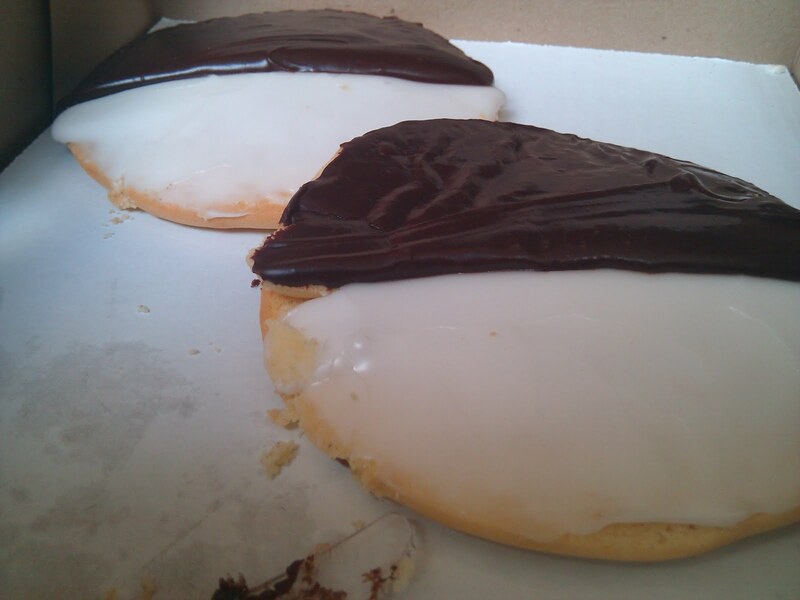 Bea's Black and White cookies are what I think of as Automatic Diet Busters. If someone brings them into the office and leaves them in the kitchen, everyone -- EVERYONE -- somehow finds their way to the kitchen and makes mental excuses to digest more than a sliver. They are that good.